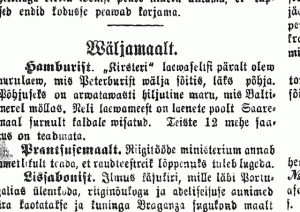 Ship lost: During the last big storm the German steamer Valeria sank near the island Saaremaa was announced by "Rev zeitung". Only tops of the masts are visible from water. Several bodies of seamen and lifebelts are found in the beach. One rescue ship headed from Tallinn to the location of the wrecking. Ship lost: From Hamburg. 6 th Oct "Kirsteri" ship company's steamer sailed out of St Peterburg and got lost. Reason is probably a heavy storm in the Baltic sea. Four seamen have been found dead on the coast. Whereabouts of other 12 man is still unknown. 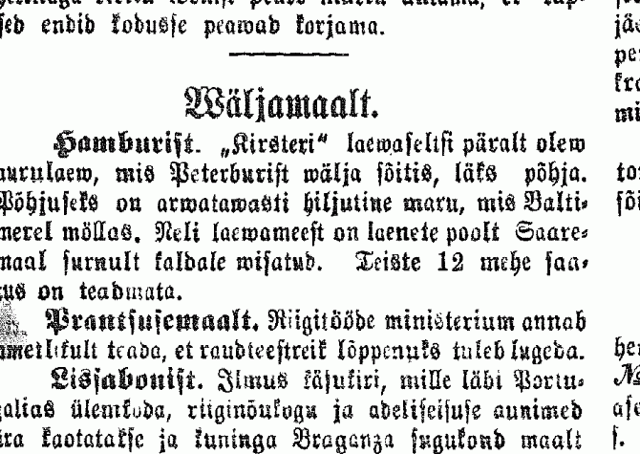 About consequences of the storm: Latest news about the lost Hamburg steamer "Valeria" near Saaremaa we can add, that four of seamen have been found dead on the beach and 12 mens fate remains still unknown. Hamburg "Kirsteri" shipping company steamship sunk on the way from St Petersburg. Reason is most probaly high gales on the Baltic sea. Four seamen are washed off shore in Ösel and found dead, other 12 are missing. 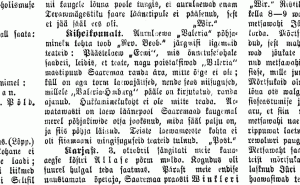 From Kihelkonna: "Reval Beob" anounces regarding sinking of Steamer "Valeria": Rescue boat "Erwi" sent to the area found that info about mast tops above the water are not correct: All other info regarding different cast away with Valeria Hamburg signatures are true. Exact position of lost ship is unknown. 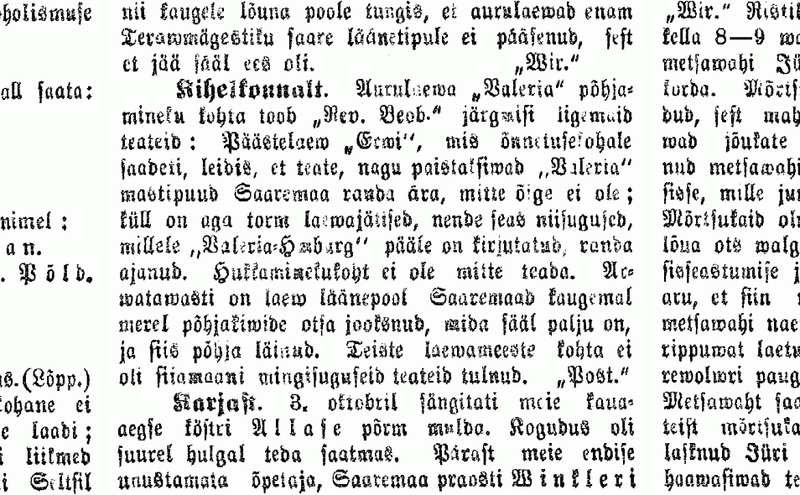 Probably the ship ran aground on the rocks western side of the Saaremaa and sank. There are no news about the missing seamen. "Post."